Life is full of curveballs along with ups and downs. It’s like being in the batter box and hitting against a pitcher that learns to mix a curveball with a knuckleball…and now it’s coming right at you. When you think you have it all figured out, it becomes a combination of new pitches in which you’ve never seen or even imagined possible. Afterwards, it becomes a struggle in the field as you have now invested so much time in trying to become a a better hitter, you begin missing ground balls. If life was made to be easy, we’d all be great at it and would all be hitting home runs. Life isn’t about what your thrown. It’s not about whether you swing and miss or hit a home run. Life is about the way you handle yourself during and after. When striking out, do you keep your head up and go back to learn from? Do you let your frustrations get the best of you and get ejected from the game or even worse, completely give up? If you hit a home run, do you stay humble and teach others how to do this? This game of life will always be challenging. It will always test us to see which path we will take. It will challenge us to work to be better. Over the last year, my mom has really encouraged me to talk to someone I blocked from my life about 5 years ago. I grew up with her, she is family. I am going to continue to call “person” and “her” as I did not ask her permission to add her name. This person was/is one of the most intelligent people I have ever met in my life. She had and still has the ability to do anything she wants if she sets her mind to it. After high school, she made some poor choices that caused me to decide to cut ties with her. Recently, I began doing a lot of self reflection on who I am, who I was, who and what is important, etc. I reached out to my mom for this persons phone number and decided to give her a call. When I called, I told her it was me and became choked up really quickly when I heard the happiness in her voice. She heard that and her first response to me was “You know I love you right?” She didn’t address her frustration of me cutting ties and blocking her out of my life. She didn’t focus on her, her focus was on me and how she really felt. She didn’t even call me any names and there are plenty them that I was deserving of. All this time I thought I was a great leader. I thought I understood it all and had the answers. In reality, I had it all wrong. Take the story from above for example. I was a hypocrit of my own words and teachings as when she hit rock bottom, I continued to stomp on her. What she needed was to know that family and loved ones loved her. I never stopped loving her, I just decided the right thing to do was put a wall up and block her out until she did the right things in my eyes. Who am I to judge someone else by what their view of happiness is or by the struggles they face? Everyone has struggles and challenges. Not everyone faces them the same way. Some take longer than others to figure it out. Loving and being humble is the constant that can’t go away. I’ve been humbled. I am and will continue to commit to learning to being humble and loving whole heartedly. Life is about holding your head up, being honest, humble and loving who is important. If you focus on this, you will reach a level of happiness in which you may not have thought possible. “Humility, the characteristic of being Humble, is the true key to measure one’s success. Successful people often forget where they come from, how they arrived there and who helped them along the way. They often embrace and overindulge in the fruits of success. They often live in excess and don’t care about anyone or anything other than themselves. Unfortunately, successful people feel like they are entitled and superior to others. IN REALITY, THEY ARE NOT! To be HUMBLED, stops this combination of arrogance and ignorance in its tracks. It brings people back to reality in a HUMBLING, and sometimes DEVASTATING, way! Humble people share the credit and wealth. They believe in treating others equally. Humble people help their fellow man/woman. 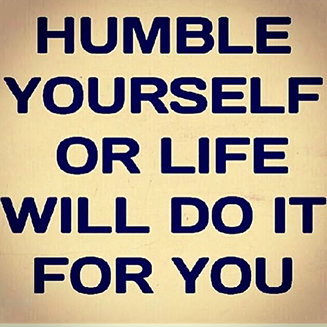 Humble People remain focused and hungry and continue on their journey toward success. Most importantly, Humble people never forget where they came from. Always Remember, the higher you climb, the farther you fall. It’s not what’s in your pocket! It’s what’s in your heart……..
Life is all about learning to dance in the rain instead of complaining about getting wet. Not all of us humans have the courage to admit when we were wrong. Finding yourselff in someone elses Mistakes takes Guts!! !.